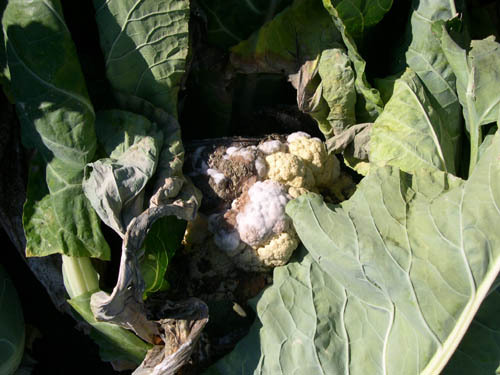 Cauliflower head with cottony white growth due to presence of S. sclerotiorum. 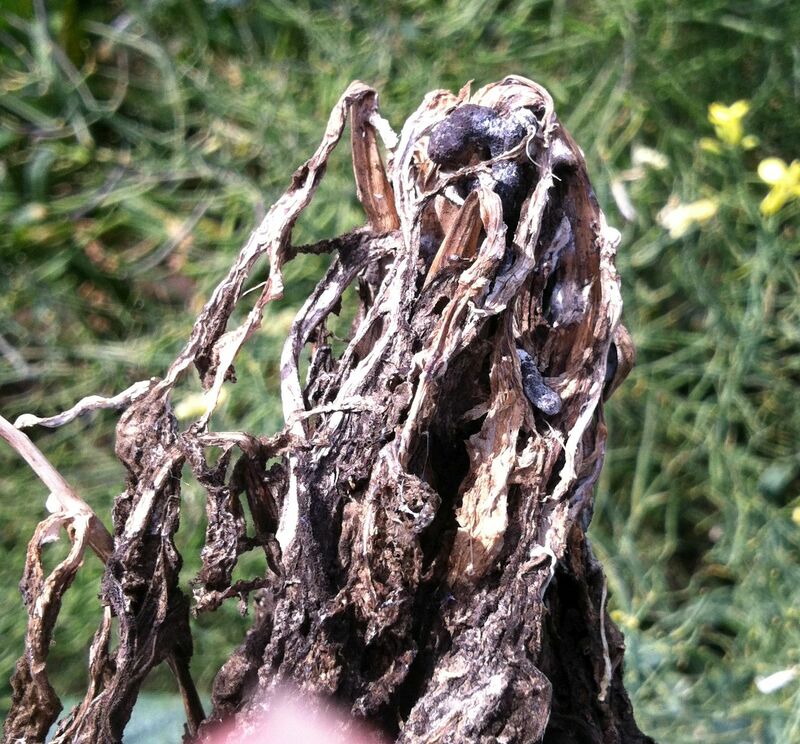 The lower stem of a dead cabbage plant containing the black sclerotia characteristic of Sclerotinia stem rot. Cause Sclerotinia sclerotiorum is a fungus that overwinters as small black structures (sclerotia) attached to decomposing infected plant portions. Sclerotia may survive several years. After a moisture-conditioning period of at least 70 days, they produce a small, stalked, cup-shaped fruiting structure (apothecium), which releases spores into the air. Spores may infect senescent tissue such as blossoms and leaves or may germinate and colonize plant debris. After colonizing, the fungus can invade any part of the plant with which it comes in contact. Moist conditions within the plant canopy favor infection, as do rain, dew, and/or irrigation practices that keep foliage wet for long periods. Other host plants include bean, carrots, pea, lettuce, potato, green pepper, cucurbits, parsnip, radish, other crucifers including canola, flower seed crops, and sunflower. Dandelion (Taraxacum officinale) is a very susceptible weed host. Symptoms The disease is mainly on aboveground parts, producing a cottony white mold. As cabbage leaves decay, small dark bodies appear in the mold. Finally, the mold is replaced by numerous hardened sclerotia that gradually change from white to black. On seed crops, stem attacks cause severe losses. Diseased tissues eventually bleach white, giving the disease its name "white blight." Sclerotia that are black on the surface and white inside, associated with this bleached tissue, are diagnostic. Endura at 6 to 9 oz/A on 7- to 14-day intervals. Preharvest interval is 14 days. 12-hr reentry. Fontelis at 16 to 30 fl oz/A on 7- to 14-day intervals. Do not make more than two (2) sequential applications before alternating to a labeled fungicide with a different mode of action (non-Group 7). Preharvest interval is 0 days. 12-hr reentry. Rovral 4 Flowable (Group 2) at 2 to 4 pints/A in 20 to 100 gal water for seed production only. Oregon (SLN OR-130001) and Washington (SLN WA-960027) only. Use at least 10 gal/A for aerial applications. Apply at full bloom, pod set, and before harvest if disease pressure is severe. Do not use treated crop debris or screenings for food or feed. Do not allow grazing in treated area. Check label for crop rotation restrictions. 24-hr reentry. Switch 62.5WG (Group 12 + 9) at 11 to 14 oz/A on 7- to 10-day intervals or at 14 oz/A for seed crops in Oregon (OR SLN-160001) and Washington (WA SLN-020016). Preharvest interval is 7 days. 12-hr reentry. Biological control Efficacy unknown in Oregon. Reference Purdy, L.H.. 1979. Sclerotinia sclerotiorum: History, diseases and symptomology, host range, geographic distribution and impact. Phytopathology 69:875-880.